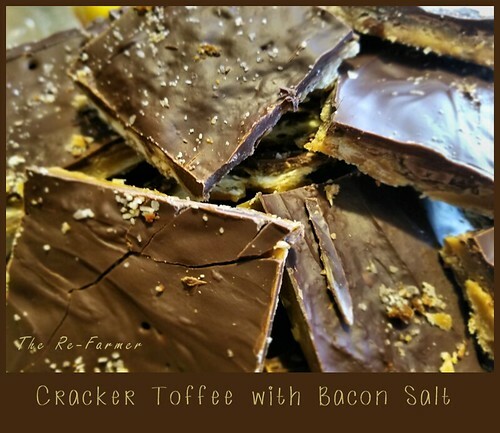 This recipe takes something I don’t normally like – chewy toffee – and turns it into a delectable treat (that doesn’t stick to my teeth!). Using semi-sweet dark chocolate chips and unsalted crackers helps keep the sweet and salty flavours from becoming overwhelming. Line a baking tray with aluminum foil. Spread a layer of crackers on the tray. Lift the edges of the aluminum foil around the crackers to keep them snug and in place. Set aside. In a small pot, melt the butter and sugar together. Bring to a boil and let simmer for 5 minutes, stirring constantly. After 5 minutes, pour the toffee over the crackers and spread evenly, making sure all the crackers are completely covered. 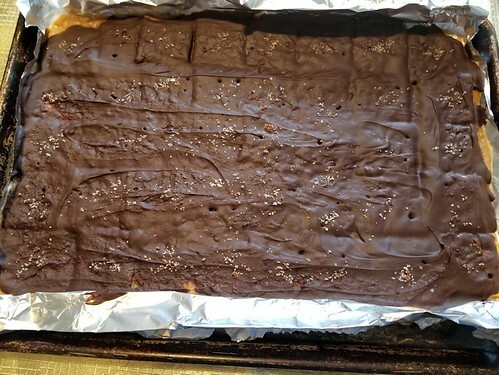 Remove from oven, then spread the chocolate chips evenly over the crackers and toffee. Let sit for a few minutes to melt the chocolate (if necessary, place the tray back into the still-warm oven to soften the chocolate), then spread the chocolate to cover the entire surface. Let cool completely. Can be refrigerated to harden faster. Once completely cold, peel away the foil, then cut or break apart into pieces. Can be stored in an air tight container at room temperature for up to 1 week. Not that they will last that long. 😉 Can also be frozen. A thought occurred to me as I was resizing the above photo, noting my very grungy looking baking pan. A 9×13 jelly roll pan, I’ve had this for many years. In fact, when I moved off the farm at age 18, it was among the items I took with me, along with cutlery I still use today, and a few other necessities. I have had this pan for 32 years and 18 moves. My mother had this pan for longer than I can remember. It’s entirely possible that this pan is older than I am!